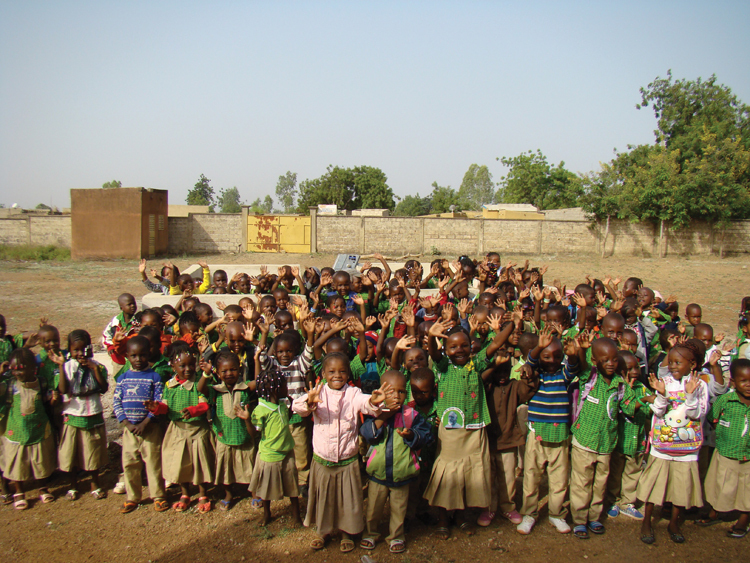 Students of the Koupela Nursery School in Burkina Faso wave in front of a well built to provide clean water to all 126 students. As Americans continue to deal with the lead contamination in Flint, Mich., and millions struggle to address water infrastructure and water quality challenges throughout the developed world, it is important to keep in mind that everything and everyone are connected when it comes to the life-giving resource of water. Individuals and groups across North America tirelessly work to address their own water-related challenges, but there are also thousands of not-for-profit organizations working to provide access to clean water and sanitation in the developing world. Ryan’s Well Foundation, one of those charities, serves as a reminder that anyone with commitment, passion, support and tenacity can change the world. In January 1998, 6-year-old Ryan Hreljac sat in his first grade classroom. He was shocked to learn that not all people had the same access to safe drinking water that he had. Not only did they not have a water fountain a few steps from the classroom, like he did, but he learned millions of children also got sick and some even died because of contaminated water. That day, Hreljac chose to address this issue. He completed extra chores around the house and saved up $70—a fortune to a 6-year-old. He thought it was enough to bring clean water to the entire world. Since then, his efforts never have waned and Ryan’s Well Foundation has helped communities across the globe for almost 20 years. Now 26, Hreljac has traveled the world and met celebrities, members of royal families and less well-known, but no less well-intentioned individuals who work with or support Ryan’s Well Foundation. He has attended state dinners with world leaders in five African countries and at Buckingham Palace, where he and others were honored as the world’s top social entrepreneurs. The Ryan’s Well Foundation worked for years on water projects in Africa with actor Matt Damon and his H20 Africa charity. He has developed youth empowerment programs and workshops with famous environmentalists like Dr. Jane Goodall and Jean-Michel Cousteau. He has shared his story with Maya Angelou. These famous change-makers understood that everyone can affect positive change. Ryan Hreljac personally visits and installs wells for Ryan’s Well Foundation. Ryan’s Well Foundation has made a difference by working with local partners to provide solutions to the water and sanitation crisis in the developing world. Since 2001, the organization has brought clean water to almost 1 million people in 16 countries. The organization also has touched millions of people by educating and inspiring people of all ages to take action and affect positive change. At Ryan’s Well Foundation, staff and volunteers are acutely aware of the need for lasting outcomes. Over the years, the foundation has partnered with local organizations and communities to deliver projects that will have long-term impacts on health and education. The foundation currently is working in five African countries as well as in the Artibonite Valley in Haiti. This work significantly impacts the lives of local people. Rather than walking long distances, often through dangerous terrain, in search of water, children can spend more time in school. Instead of caring for sick family members, women can invest more time in income-generating activities. Safe, clean latrines mean privacy and dignity for children. Hand-washing stations and hygiene training reduce the spread of deadly but preventable diseases. In addition to new water and sanitation projects, Ryan’s Well Foundation continues to work on sustainability practices. Through its Project Look Back initiative, staff members are reviewing data gathered from the Rukingiri Women’s Integrated Development Foundation, a longtime partner in southwestern Uganda, on 182 protected springs, two deep wells, and 15 latrines and hand-washing stations that have been constructed since 2003. The state of various water sources and the status of local water committees are being revisited. Water committees have provided feedback on what worked and what needed improvement during the planning, implementation, completion and evaluation stages. Refresher courses on water, sanitation and hygiene education training are planned for the near future. By supporting long-term monitoring of water projects in collaboration with local partners and communities, local maintenance issues can be identified and addressed. Ryan’s Well Foundation strives to maintain a lean organization consistent with delivering sustainable projects. It aims to educate and inspire others to build a brighter future. Its initiatives have allowed communities to grow and prosper through better health, higher education and improved opportunities as they move from the harsh cycle of deprivation to a more promising future. In 2001, when Hreljac was on the Oprah Winfrey Show for the first time, Winfrey said, “You are really living proof that one person—and it really doesn’t matter how old you are—can really make a difference.” Hreljac continues to be a compelling voice for those impacted by the water and sanitation crisis throughout the developing world. His message is clear: every person on the planet deserves clean water, and everyone can make a difference. Megan Glenn is communications and fundraising coordinator for Ryan’s Well Foundation. Glenn can be reached at [email protected] or 613.258.6832.